God is my portion, and my cup: Faith -- Our God Always Waits Us To Give Victory In Him! Faith -- Our God Always Waits Us To Give Victory In Him! “At just the right time, I will respond to you. On the day of salvation I will help you. as my covenant with them. After the humiliating defeat before Ai, the Israelites were paralyzed at this turn of events, and their courage melted away. They looked each other, and they could not believe about their defeat. It was a really humbling moment. They were turned out to be absolutely powerless before the smallest city, Ai. The Israelites discovered the true nature and reality about themselves. The news of the defeat of Israelites quickly spread. All of the people in the Promised Land knew, and all inhabitants of the Promised Land looked down on the Israelites. The Israelites were powerless before Ai, which was one of the smallest. What did this really mean to the Israelites? No more progress in the Promised Land because they would not able to conquer any other cities from that on. The Israelites were stuck in one small corner of the Promised land. The Israelite’s dream of inheriting the Promised Land was completely shattered. Even they did not know where to go from there. 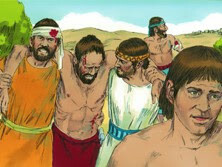 All of the Israelites were in absolute despair. However, it was the very moment that God, who dearly loved His children, specifically prepared for them. God was with the Israelites in the mist from the begging and till the very moment, while patiently waiting. What was God really looking for? 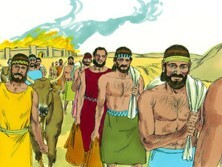 God wanted for the Israelites to return to Him. They had gone out on their own as if they knew everything and had power to accomplish what they wanted. When the reality hit, they did not know what to do expect despair. Yes, even in the mist of absolute despair and devastation, God was there for them. There was no place to go except God, Joshua realized, after being hitting hard. Upon realization of this, Joshua immediately returned to God, and spread out his pain and problem as his prayer. God had been waiting long for this moment. God saw Joshua who was truly humbling before God along with the entire Israelites. God answered. He revealed the hidden sin of Achan because the sin was the barrier between God and the Israelites. As long as the sin existed, no more victory except painful and humiliating defeats. Upon hearing God, Joshua quickly responded by getting rid of the Achan’s sin completely. As soon as the loving relationship between God and the Israelites was restored, God, the ever-loving Father, comforted and encouraged the Israelites. God even allowed to keep the plunder and livestock for the people. God knew what they wanted, and answered with His blessings to the Israelites. On top of this blessing, God gave His precious wisdom. Although Ai looked weak, defeating Ai was so easy as it looked. God told to set an ambush behind the town, which was never thought about before by Joshua and the Israelites, who were proudly in their own strength after defeating Jericho. So Joshua and all the fighting men set out to attack Ai. Joshua chose 30,000 of his best warriors. Initially Joshua sent 3,000 warriors, but he experienced the total defeat. In humility, he called for 30,000 of his best warriors. 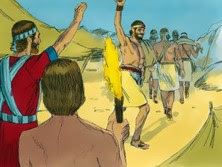 The chosen 30,000 warriors left and went to the place of ambush between Bethel and the west side of Ai. But Joshua remained among the people in the camp that night in prayer to God. He was with God while being careful and sensitive to hear God. Early the next morning Joshua roused his men and started toward Ai, accompanied by the elders of Israel. Joshua did not go just alone either. He set out with the elders, the spiritual leaders also to continually be connected with God. All the fighting men who were with Joshua marched in front of the town and camped on the north side of Ai, with a valley between them and the town. Joshua wisely planned and executed according to God’s wisdom. That night Joshua sent 5,000 men to lie in ambush between Bethel and Ai, on the west side of the town. So they stationed the main army north of the town and the ambush west of the town. Joshua himself spent that night in the valley. When the king of Ai saw the Israelites across the valley, he and all his army hurried out early in the morning and attacked the Israelites at a place overlooking the Jordan Valley. But the king of Ai didn’t realize there was an ambush behind the town. Of course, it was done by God. God made the king blind about an possibility of being ambushed. Joshua and the Israelite army fled toward the wilderness as though they were badly beaten. All the men in the town were called out to chase after them. In this way, they were lured away from the town. There was not a man left in Ai or Bethel who did not chase after the Israelites, and the town was left wide open. The God’s set time had come. God said to Joshua, “Point the spear in your hand toward Ai, for I will hand the town over to you.” Joshua did as he was commanded. Joshua raised his spear high while giving thanks to God. As soon as the warriors saw Joshua’s raised hand high with his spear, all the men in ambush jumped up from their position and poured into the town. They quickly captured it and set it on fire. When the men of Ai looked behind them, smoke from the town was filling the sky, and they had nowhere to go. For the Israelites who had fled in the direction of the wilderness now turned on their pursuers. When Joshua and all the other Israelites saw that the ambush had succeeded and that smoke was rising from the town, they turned and attacked the men of Ai. 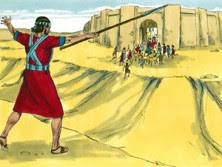 Meanwhile, the Israelites who were inside the town came out and attacked the enemy from the rear. So the men of Ai were caught in the middle, with Israelite fighters on both sides. Israel attacked them, and not a single person survived or escaped. Only the king of Ai was taken alive and brought to Joshua. When the Israelite army finished chasing and killing all the men of Ai in the open fields, they went back and finished off everyone inside. So the entire population of Ai was wiped out that day—12,000 in all. For Joshua kept holding out his spear until everyone who had lived in Ai was completely destroyed. Only the livestock and the treasures of the town were not destroyed, for the Israelites kept these as plunder for themselves, as God had commanded Joshua. So Joshua burned the town of Ai, and it became a permanent mound of ruins. 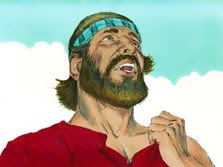 Then the first thing that Joshua did was to build an altar to the LORD, the God of Israel, on Mount Ebal according the command received by Moses form God. He made the alter with uncut stones with iron tools, and presented burnt offerings and peace offerings to the LORD. And as the Israelites watched. Then all praised the name of God, who was the ever-loving Father for the Israelites, who were dearly loved by God because they were God’s children. God has been always faithful. God, who had dearly loved Joshua and the Israelites, loves us because we are His beloved children. He watches over every step that we make. Whenever we are sinning and off from His word, He is in pain. He, who is full of mercy, then waits for us with His unfathomable patience. God waits and waits till we return to Him as Joshua and the Israelites returned to Him. Today, God eagerly wants to see us returning to Him. Yes, we might have sinned against Him or our family, relative, neighbor, co-worker, or business partner. Our hearts are heavy due to the sin that we have committed. Due to those sins, we are suffering and suffering both mentally and spiritually. This slowly and steadily undermines us. Let’s stop, and look at Him directly. Then turn 180 degrees, and walk toward Him or even running into Him while fixing our eyes on Him. Surely we can see His broad and open arms always waiting for us. Why? He is Our True Father. He eagerly waits for us to forgive all our sins to restore our precious father-and-child relationship. Let’s not disappoint God. Now is the time to return to Him, Our Loving Father. Then He will provide all things that have been prepared for us, which have been blocked by our sins and disobedience. As Joshua did, we build our alter in our heart, and present ourselves to God. Then His joy in us will be completed, and our joy in Him also be completed. What a beautiful scene it will be for both God and us! Praise Him, who is our one and only one God, our Ever-Loving Father!